Pronunciation of Suffolk place names. Some placenames in Suffolk are not pronounced as they are written. So what? Well, for the user of this site, especially across the Atlantic or in the antipodes, They might feel closer to the home of their ancestors by being able to pronounce it as their ancestors did! This is an attempt to list all the placenames in Suffolk that are not pronounced exactly as they appear. A few starting points. 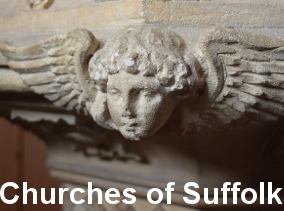 In common with other English placenames, Suffolk placenames are usually pronounced with the stress on the first syllable. Among towns in Suffolk, Saxmundham is the great exception. I have tried to include all exceptions below. The following is not an attempt at Suffolk dialect. This is how someone with a standard English accent (like myself) would pronounce them. Where the Suffolk dialect pronounciation differs, I have tried to include this. Particularly for visitors from across the Atlantic, there is an issue with places ending in -ham, -ton, -by and -ford. Contrary to American usage, and in common with other English placenames, -ham at the end of a placename is invariably pronounced -um, with a short u. Thus, Lavenham is Lav'n -um. -ton is usually pronounced -tun, with a short u, best expressed as -t'n. Thus, Boyton is Boy-t'n. -by is usually pronounced -bee. Thus, Ashby is Ash-bee. -ford is usually pronounced -fud, with a short u, best expressed as -f'd. Thus, Playford is Play-f'd. I have not attempted to include all -ham, -ton and -ford endings, where the pronunciation is otherwise obvious. Please accept the above as a general guide. I HAVE included towns where this is an issue. Also, most English people convert a middle T into a glottal stop, moving the consonant into the back of the throat. This obviously affects placenames like Boyton. I haven't included these in the list below, unless there are other pronunciation issues. The stress is on the first syllable, unless otherwise stated. Akenham is Ake-un'm, the first syllable rhyming with lake. Alpheton is Al-fee-t'n, with the stress on the middle syllable. Athelington can be Al-ing-t'n, but most Suffolkers call it Ath-ling-t'n. Bramfield is Bram-feeld and Brampton is Bram-pt'n, but Bramford is Brar-m-f'd! Brome rhymes with dome, not with doom. Bures is Bew-ers, but Suffolkers tend to call it Boo-ers. Chelmondiston is as it looks, but the stress is on the third syllable. Erwarton is as it looks, but the stress is on the second syllable. Eye is as it looks, like the letter i.
Groton is Grow-t'n, the first syllable rhyming with slow. Halesworth is as it looks, but becomes Harls-w'th in the local accent! Haverhill is Hay-ver-ill, usually reduced locally to two syllables, Hay-vrill. Hinderclay is Hin-der-clay, the first syllable rhyming with shin. Horham is Horrum, the first syllable short, sounding as in Horror and the same length as the first syllable of Durham. Hoxne is Hox-un, rhyming with oxen. Iken is eye-k'n, the first syllable the same as Eye. Ilketshall is Il-ka-shawl, with the middle 't' only faintly there. Kirton is the same as curtain. Lavenham is Lav'n'm, which locally becomes two syllables rather than three. Long Melford is Long Melf'd, but Melford becomes Mel-f't locally. Lowestoft is Lower-stoff't, the final t omitted locally. Onehouse is as it looks, but locals call it Wun-uss! Parham is Parrum, the first syllable as in parrot. Ramsholt is Ram-sawlt, the last syllable the same as salt. Saxmundham is Sax-mund'm, but, unusually, the stress is on the second syllable. Somerleyton is Summer-layt'n, the stress on the third syllable. Stowmarket is as it looks, but locals prounce it Stoo-market, with the stress on the second syllable! Thelnetham is Thell-nay-th'm or Thell-nee-th'm, with the stress on the second syllable. Thwaite can be T'wait, but most people call it Thwait. Uggeshall is Ugg-a-shawl or Ugg-a-sh'l. Waldingfield is Wall-dingfield, with the stress on the first syllable. Waldringfield is Wall-dringfield, with the stress on the first syllable. Great Whelnetham and Little Whelnetham are Well-nee-th'm, with the stress on the second syllable. This village is sometimes spelt Welnetham. Wissington can be Wiss-t'n, more commonly Wissing-t'n these days.